You are currently browsing the tag archive for the ‘Cat Stevens’ tag. For your lorry loads pumping petrol gas. The song has deep meaning about mankind blindly stifling even the simplest things in the name of progress so that maybe one day, even effect basic things, like where the children will play become absent and meaningless. Video games are proof of the prophesy of that song from the seventies. Today, however, I take a different twist on the song. Rolling on roads over fresh green grass. And it seems that you can’t get off ….because ALL the exits are blocked. Yes, indeedy, summer is road construction season here in the US of A. It’s a proud tradition that nobody understands. OK, I understand roads need to be fixed. Lanes need to be paved and widened. New potholes need to be made. Signs that say, “There’s nothing better than a gas station roller dog. Next roller dog 35 miles” need to be replaced. And, I am sure the process is planned with painstaking precision. But, I do have a few questions on said process. Why would they do it in the busiest travel season of the year, Summer? Why muddle an already congested highway with even fewer lanes of traffic? Why are two out of three lanes of traffic blocked for 75 miles when the only visible sign of construction is a solitary bulldozer at mile 3? Here’s another one. 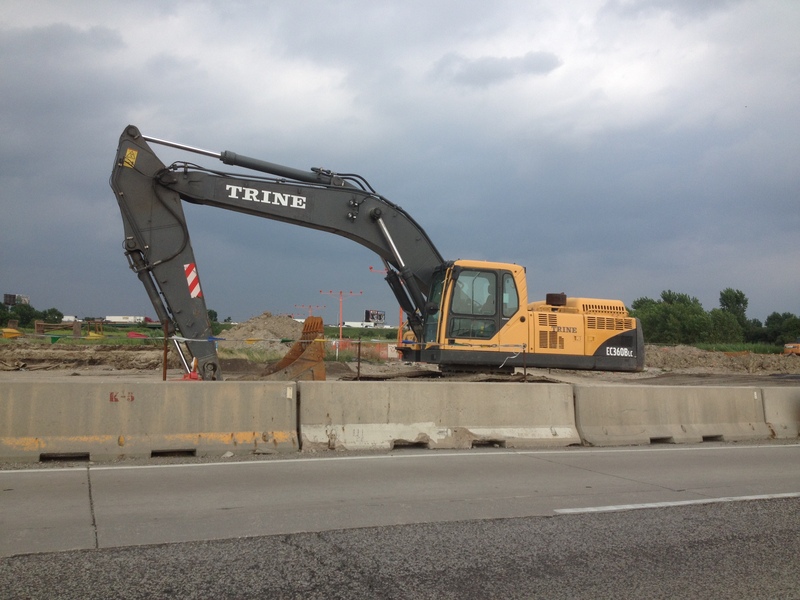 Road construction is taking place on a major highway that travels from north to south. Brilliantly, the other two major highways on either side that run north and south are also under construction. This leaves the only untrammeled north south highway 50 miles to the east or west in either direction. Why? Don’t get me wrong. I am sure these road construction workers are hard working individuals. In fact, it may be only ONE individual, because all I see is that one guy driving a bulldozer at mile 3. I don’t know. Maybe there’s more. Sometimes, I see 5 or 6 of them staring intently at a pile of dirt the bulldozer must have dug up at Mile 2 four weeks ago. Sometimes, I see a cement truck and a crane at Mile 4. Perhaps they are planning a strategy for when the bulldozer gets there next month. I live in the Chicagoland area. Our roads are SOOOO good here in Northern Illinois that you have to pay to drive on them. We call them Toll Roads. Then one day, when summer is over, the construction is miraculously complete and you never ever saw it coming. Wider lanes. Bigger pot holes. Rollers dogs every 15 miles. This is the world you saw Cat Stevens. Sing about it.